The concluding volume in the Hunger Games trilogy has a difficult task to accomplish. It has to take a series that until now has focused tightly on the very personal trials faced by its main character and expand it into the story of a continent's rebellion against a dystopian government while still telling the entire story from Katniss' perspective. There's also the issue that after the events in the first two books Katniss is seriously traumatised and at various times in the book is either catatonic or delusional, and has an increasingly volatile temper. I think it's very believable that Katniss should have suffered a lot of psychological damage from the things she has lived through, and I think it would have been completely unbelievable for her to still be the same character she had been in the first book, but it doesn't make it an easy book to read at times. It's often a fairly grim read which sometimes make the earlier books in the series feel like halcyon days where the worst thing happening was a bunch of teenager being forced to kill each other in televised gladiatorial combat. Collins makes it quite clear that while it might be a just war, it's still a very bloody one and although the government's leaders continue to put most Bond villains to shame when it comes to villainy as the rebellions progresses the rebels themselves sometimes seem little better. In many ways this attempt at showing the costs and moral ambiguity of an armed rebellion is commendable, but it's also where this novel runs into its biggest problem. Throughout the series the world-building felt unsubstantial and not particularly convincing and that wasn't really a huge problem for the first couple of books because most of the world only served as a place for Katniss to stay in until she reached the arena, and its lack of depth was largely irrelevant. However, it does become more of a problem when the series moves away from being an escapist satire on reality television and starts trying to be a serious tale of a bloody uprising. The novel is trying to bring up some genuine moral dilemmas about how much violence would be justified in the fight against tyranny, but the setting and situations are so contrived that they detract from the attempts at trying to explore the novel's themes. It's difficult to really care about some of the battles and events when it sometimes isn't clear why they are being fought in that particular way and what the stakes really are. Another problem is that the book is in a bit of a no-win situation with regards to how it shows the progress of the rebellion from Katniss' viewpoint. Katniss spends much of the novel in the relative safety of District 13, only hearing fragmentary information about the progress of the rebellion, which is frustrating for both her and the reader. On the other hand, some of the attempts to have Katniss on the front-line of the rebellion stretch credulity, a scene where Katniss and Gale try to shoot down incoming bombers using a bow-and-arrow is probably one of the silliest scenes in the series. 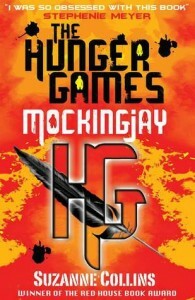 The final part of the novel attempts to bring up similarities between the final assault on the Capital and the Hunger Games, but it feels contrived and some of the events are excessively manipulative even by the standards of the series. This is a bold attempt to turn an entertaining escapist series into something with a deeper meaning, but not an entirely successful attempt. Sometimes it is a compelling read, sometimes a frustrating one and although it makes an interesting conclusion to the trilogy it is also the weakest book in the series.